White, a third generation family owned business, is celebrating its 70th anniversary this year. The company manufactures a full line of Dry Cleaning, Laundry, Hotel/Casino/Resort, Correctional Institution, Retail, and Residential garment handling solutions. Since its founding in 1944, White has installed nearly 100,000 conveyors in the United States and throughout the world. 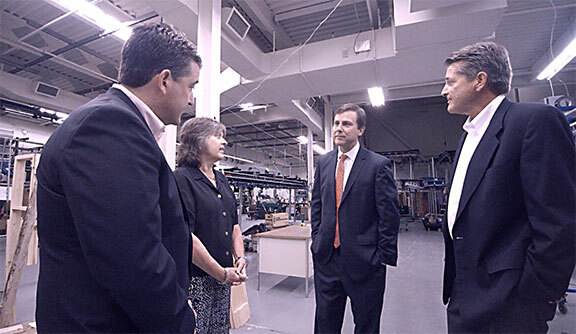 Senator Kean was given a tour of the 90,000 square ft. plant by company president Mary Speckhart, along with her brothers Stephen and John Speckhart. As they toured the facility that employs over 100 people, the group discussed the opportunities and challenges facing New Jersey manufacturers. According to the National Association of Manufacturers, manufacturing accounts for 90.6 percent of New Jersey’s exports. White Conveyors has experienced consistent, steady growth over the years and has recently expanded its national and international sales network. The manufacturing sector in New Jersey has suffered gradual decline over the last decade, however, there are signs it has recently stabilized.